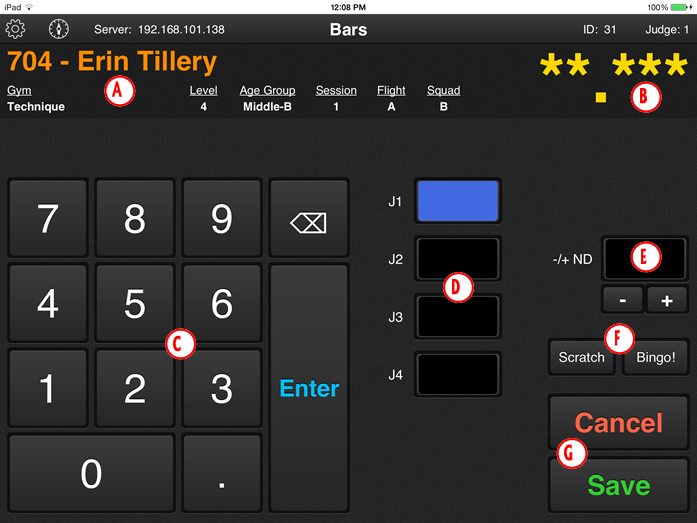 About ProScore iKeypad is an app that allows the judge to enter scores using an iPad. The app uses your Wi-Fi network to communicate with the ProScore software. The ProScore iKeypad can be used in conjunction with our normal judges keypads provided that each is used for separate events. 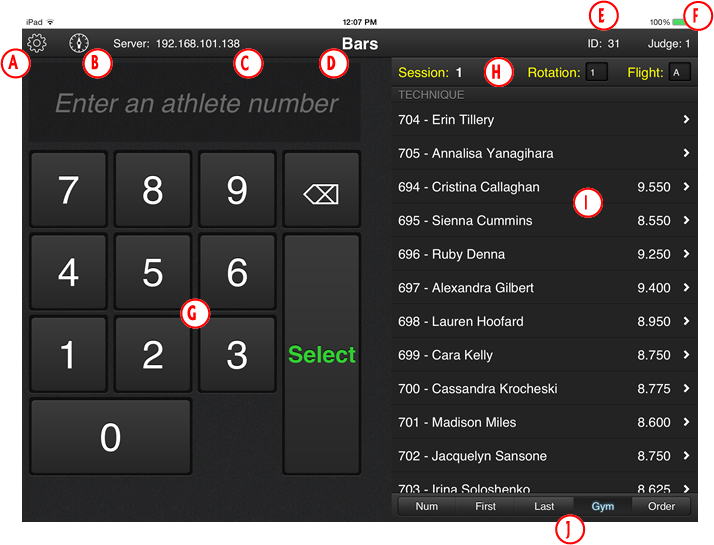 Features • Use 1 iKeypad for the event and enter each judges score or have each judge use their own iKeypad. • Enter the gymnast number or select the gymnast from the list. • Scratch and Bingo buttons to speed up the score entry process. • Built in countdown timer to time warm-ups. • Supports both Women and Men artistic. • Supports JO, FIG and NCAA. Requirements • Must be used with the ProScore gymnastics meet management and scoring software v5.1.0 (or later). • A connection license for each iKeypad is needed. See Pricing Tiers. • Uses your Wi-Fi network to communicate with ProScore. No Internet connection needed. • iPad must be running iOS 7 or newer. • iPad can be either full size or Mini. Setup The iKeypads are setup just like our normal keypads. Each iKeypad is assigned a keypad ID that matches an ID that is entered into ScoreGen for an event. No two iKeypads or normal keypads should ever have the same ID. The ID is set on the Settings screen on the iKeypad. You access the Settings screen by pressing the icon. On the Settings screen you can also enter the password that is used to log into ScoreGen (see Wi-Fi & Security below) as well as select the IP address of the computer running ScoreGen. Wi-Fi & Security The iPads running the ProScore iKeypad app will need to connect to a Wi-Fi network that the computer running ProScore and ScoreGen are also connected to. You may already have a Wi-Fi network in your gym or you may need to setup a Wi-Fi network. If you have to setup a new Wi-Fi network then you should get a wireless router a your local office supply or computer store and set it up according to the instructions. It's a good idea to keep the Wi-Fi network that you use for scoring separate from any Wi-Fi network that would be available for the general public. It's also a good idea to password protect the scoring network so that only authorized scoring personnel have access to the network. This prevents unauthorized access and also cuts down on unnecessary traffic. If you use a building supplied Wi-Fi network (even one that is password protected) make sure that the network does NOT use isolation. This can be called wireless isolation, client isolation, AP isolation, or station isolation. This feature confines and restricts clients connected to the Wi-Fi network. They can’t interact with devices connected to the more secure wired network, nor can they communicate with each other. This will prevent iKeypad from connecting and communicating with ScoreGen. When an iKeypad attempts to connect to ScoreGen it has to supply a correct password before it will be allowed to connect. This password is defined by you in the ScoreGen setup. The same password must be entered into the iKeypad Settings screen. This password is used to prevent unauthorized iPads from connecting to ScoreGen. It's a good idea to change the password often or maybe use a different password for each meet. The iKeypad and ScoreGen communicate over UDP port 51515 and TCP port 51514. If you find that the iKeypad cannot locate or connect to ScoreGen, it may be a firewall that is blocking it. Please make sure that your Windows firewall is not blocking the ScoreGen application or either of those ports. You might also want to check if your network has a firewall that could be blocking those ports. Battery Management An iPad has an extremely good battery and will last for quite a while. Our testing has shown that an iPad can be used running the iKeypad app for 10-12 hours on a single charge depending on the length of the sessions and the time between sessions. To achieve this, you need to eliminate any unnecessary functions of the iPad that would drain the battery. Apple has some good information here. Lower the brightness to 25-30%. This is probably the single most important setting to change. The display will be on continuously while iKeypad is running so the lower the value the better. Put the iPad in Airplane Mode and then turn on the Wi-Fi portion only. This will turn off the Bluetooth and Cellular functions that are not needed. Turn off Location Services. Turn off in Settings > Privacy > Location Services. Turn off Background App Refresh. Go to Settings > General > Background App Refresh and set the switch to Off. Lock the iPads in between sessions when they are not being used. Inform your judges to simply press the lock button on the top of the iPad to turn the screen off when they are finished judging the session. You might want to have portable battery chargers, capable of charging your iPads, available for each event in case the battery runs out before the end of the session. Select a gymnast by either entering their assigned number and pressing Select or tapping on the gymnast on the athlete list. The score entry screen will slide into view (see next page). When finished entering the score, this screen will slide back and you can select the next athlete. At the end of a rotation or flight, click on the Rotation or Flight selections to choose the next one. The judge field that is highlighted in blue will receive the score that is entered. If a judge field is not highlighted, simply tap on the field you want and then enter the score. When entering scores for an athlete the first time, the J1 field will already be selected. Simply enter the score and press Enter. The J2 field will automatically be selected for you. Repeat this for each judge’s score. Neutral deductions are entered by pressing the - or + buttons to decrease or increase the deduction. Remember that neutral deductions must be negative. If the gymnast is scratching simply press the Scratch button and all judges’ scores will be set to 0.0. If all judges have the same score (bingo), simply enter the score for J1 and then press the Bingo button. All other judges’ scores will be set the same as J1. Press Save to save the scores or press Cancel to throw them away. The athlete selection screen will now slide back.